A seaside-inspired dining room doesn't have to be all anchors and sails to feel coastal or relaxed. 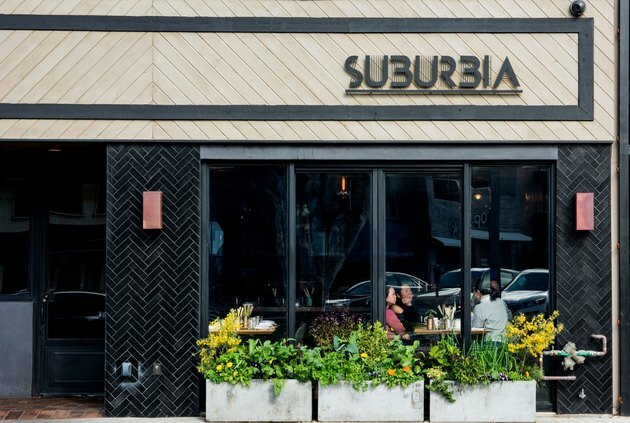 Just look at Suburbia, a restaurant in Los Angeles set a few blocks from the beach. 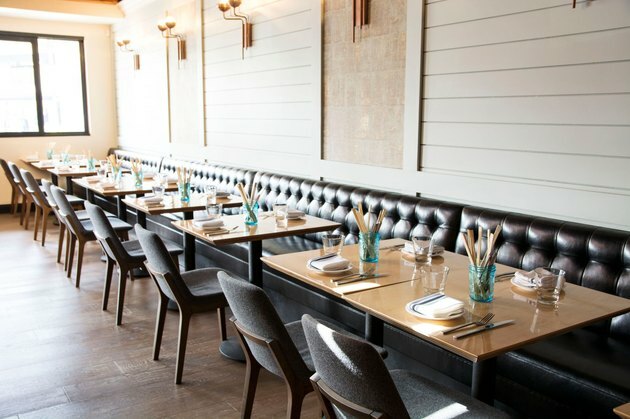 Founders Tin Vuong and Jed Sanford wanted to create an all-day eatery that reflected the community when they partnered with Bishop Pass on the design, so they stuck with a light and neutral color palette that would pair well with the fresh menu and area's sunshine. The result is an aesthetic that mixes modernist touches — like a copper chandelier and exposed beams — with casual cool finishes like painted black brick and a custom leather banquette. "I wanted to open a place close to our house where I could dine with my family on a regular basis," Sanford said. And with a place as laid-back and cozy as Suburbia, he won't be the only local making this a go-to spot. The sliding glass doors at the front of the restaurant bring in lots of natural light, and the green of the fresh herb planters pops against the painted black brick. The exposed wood beams and industrial windows at the back of the restaurant are original to the building. Bishop Pass tapped local fabricator April Robb to make the copper chandelier. Over on the banquette side of the restaurant, the design team turned sheets of copper into art installations. They fit right in with the blue-gray shiplap, which is painted "Comfort Gray" by Sherwin Williams. Sconces by ELA Lighting hang over the custom leather banquette made by Tolteca Manufacturing, and the gray Dane dining chairs are from West Elm. 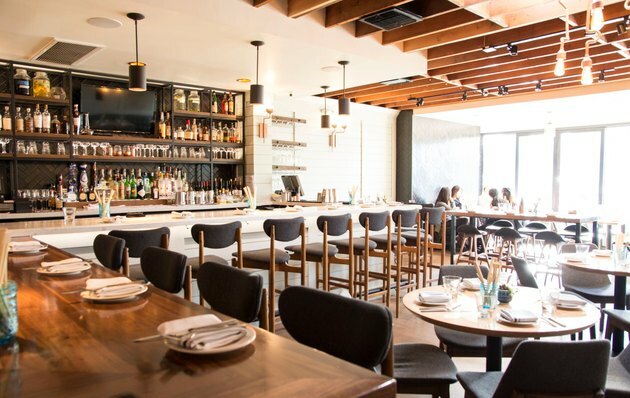 The counter-height bar invites locals to come in for a tapas plate or spam musubi. At night, light from the Workstead pendants illuminate the bar. 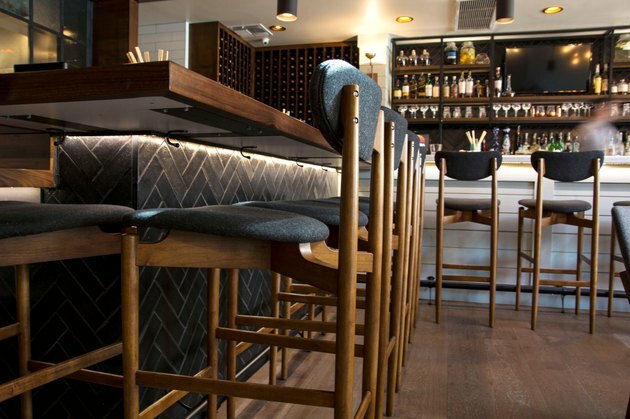 The Dane barstools are from West Elm. 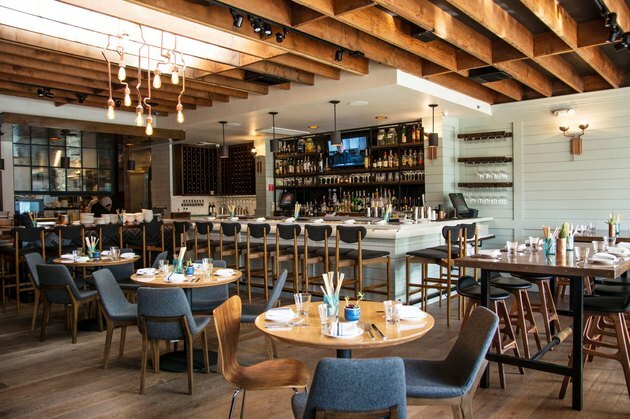 Here are two perfect examples of tying the same elements throughout one space — the painted brick from the restaurant's facade and the wall shiplap also show up underneath the bar.